Mab, Faerie Queen of Winter, returns requesting the second of the favors owed her by Harry. Harry does not want to fulfill this one, but Mab is persuasive, plus she claims he’ll be killed if he does not help. Another motivating factor is that Summer is already pursuing him in the form of gruffs, goat like Faeries intent on killing Harry. Mab’s request is that Harry find the mob boss John Marcone, a frequent minor character in previous Dresden Files books. It does not take Harry long to discover that Marcone was taken by the Order of the Blackened Denarius. Realizing he needs more help, he brings in Thomas, Murphy, and a reluctant Michael to help. The kidnapping of Marcone was more complex than Harry first suspected and he is dragged deep into the plot by the Nickleheads as Harry likes to refer to the Blacked Denarius group. This book contains multiple large-scale battles between Harry and his allies and the Nickleheads or Harry and the Summer Faeries. Harry faces ever stronger gruffs, who, despite the scorn of Harry’s allies, turn out to be a lot stronger than expected. 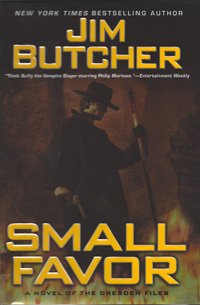 I enjoyed this book, but I think Butcher missed an opportunity to fix one of the few flaws I think he has as a writer, his refusal to kill off major characters. Without that fear his action sequences are missing a small element that would make them better, the fear of death. As the reader, you know the good guys will survive, even if they do not always win. In this book a major character takes what should have been a mortal wound, and while Butcher left some doubt as to the character survived, that doubt ends quickly. Still the book is good and Butcher continues growing the characters. This is where he is strongest and I am willing to overlook a few flaws he has in his writing.